The Mediterranean diet is focused on mimicking (sort of) the diets of people who live around the Mediterranean Sea. Even major medical institutes such as the Mayo Clinic tout it as a heart-healthy diet. Its key goals are to reduce low-density lipoproteins (bad cholesterol), reduce sodium levels, increase fiber and increase micronutrients. Dairy is a hard habit to kick, isn’t it? It’s not just mildly addictive, though. Fortunately, it’s also good for you. With reduced servings, your body may start calling out for more calcium, vitamin D and of course those sweet, sweet opiates and amphetamines. This diet is all about whole grain foods, fresh veggies, fruit, nuts, beans and olive oil. By comparison, meats, cheese, eggs, fish, and yogurt make up a much smaller portion. This plant food emphasis helps you take in a high volume of vitamins, minerals, and other beneficial nutrients, like antioxidants and natural fiber. Red meat is used less in this diet than in the United States, which may cause some concern about iron, zinc and several other vitamins. However, this reduced amount isn’t a huge problem as many beans, grains, and vegetables supply some of them. Recommended Products: Iron & C+Zinc. Where you will run into trouble with this diet is with calcium and vitamin D. The Mediterranean diet recommends only two servings of dairy food per day, while the USDA recommends around 1000 milligrams or more per day. That’s 3 or more servings of dairy every day. Many people already take extra calcium, but for those who don’t, a daily calcium supplement when following this diet is something to consider strongly. Recommended Products: Vitamin D & Osteo-CalMag. The Mediterranean Diet is one of the most nutrient-rich diets you could ever hope to find, but even the world’s most nutrient dense diets have their gaps. 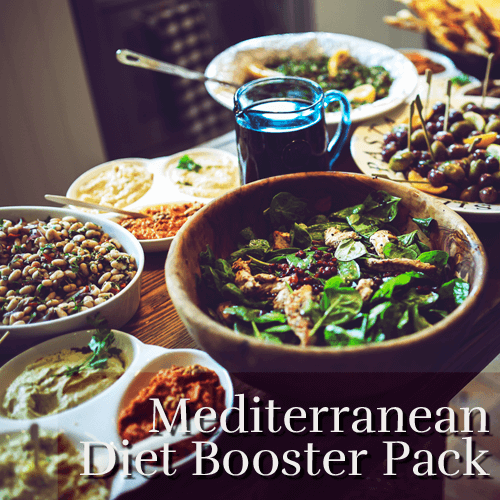 The Mediterranean Diet Booster Pack can fill in those gaps with Iron, C+Zinc, Osteo-CalMag, and Vitamin D, all for 20% off the cost of purchasing them individually.